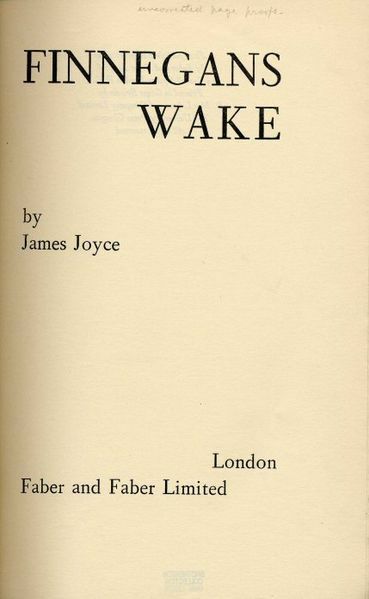 Finnegans Wake, Joyce’s final work was created over a period of fifteen years with composition starting in 1923. It was finally completed in 1938. Joyce celebrated its eventual publication on February 2nd 1939. Like all of Joyce’s works Finnegans Wake was dogged by publication controversy. He found, due to the perceived obscurity of the text that even his closest allies lost faith in his last artistic venture, finding it too obscure and occluded to penetrate and it was only his own innate belief in his artistic mission that carried him through to complete the work. The title came from the popular Irish ballad about a hod carrier called Finnegan who falls to a supposed death from a building but is revived by a skite of whisky which is thrown in the drunken melee that ensues at his wake. 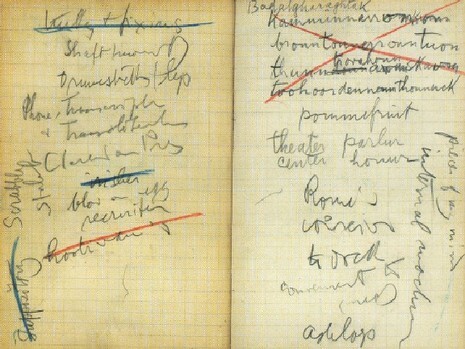 Joyce kept the title of the work a closely guarded secret for many years whilst issuing sections of the work for publication entitled ‘Work in Progress’. Joyce's last and most innovative prose work, written in a revolutionary narrative style that approximates the protean norturnal dream world. In a 1926 letter to Harriet Shaw Weaver, Joyce alluded to his development of this style when he commented that a "great part of every human experience is passed in a state which cannot be rendered sensible by the use of wideawake language, cutanddry grammar and goahead plot"